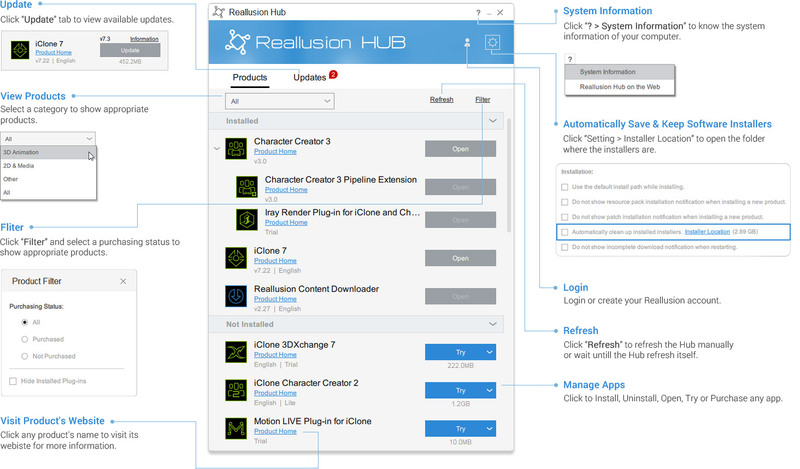 The Reallusion Hub is the manager of all your Reallusion programs and plug-ins, helping you easily utilize and organize everything in one place. 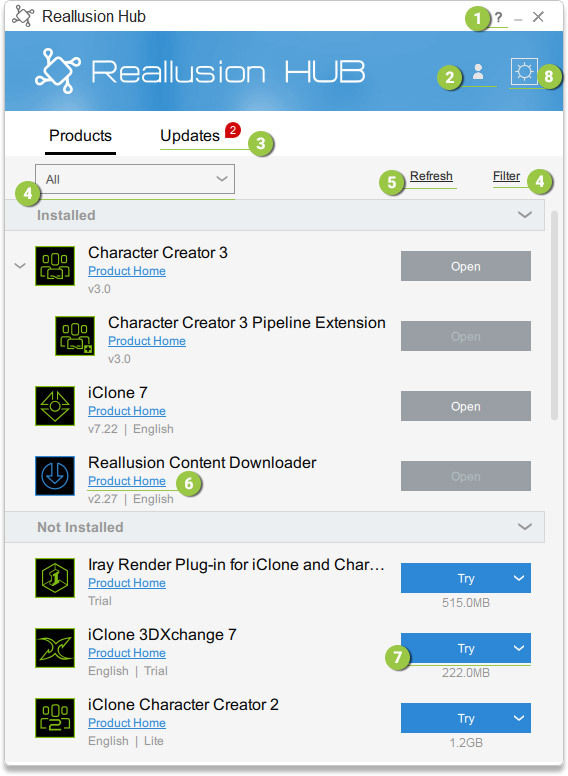 Through the Reallusion Hub you can quickly review, open, install and update any 2D/3D animation program or plug-in you already own. What's more, is that with the Hub you can download other Reallusion products for FREE, giving you a chance to try before you buy. You can view all your purchased products and their information in one place, and then click to launch selected apps. The Hub will automatically remind you when a new version of an app is available, and provide you with detailed update information. The Hub will install and update all apps and plug-ins in order, so that you don’t have to worry about any update interdependence among installations. The Hub displays all our apps and plug-ins that are designed to meet different kinds of animation needs, so you can easily explore new products and discover novel solutions for your work. You can easily download, install and launch the trial versions for all our products via the Hub. If you're satisfied after the trial, then you may use the Hub to purchase the full-versions. Save time by downloading multiple products at once! This is especially helpful when you wish to install many apps on a new computer. To prioritize your tasks and internet bandwidth, you’re able to pause and resume the download process at anytime, even after restarting your computer. Click “? > System Information” to know the system information of your computer. Login or create your Reallusion account. Click “Update” tab to view available updates. Select a category to show appropriate products. 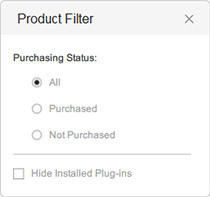 Click “Filter” and select a purchasing status to show appropriate products. Click any product's name to visit its website for more information. Click the button to Install, Uninstall, Open, Try or Purchase any app. Click “Settings > Installer Location” to open the folder where the installers are. At Reallusion, we always strive to deliver the best possible products and services. For this we regularly need every customer’s feedback! So you are more than welcome to visit our forum to share your comments, opinions and suggestions.